METRO: It’s an age-old puzzle that’s stumped generations of scientists. 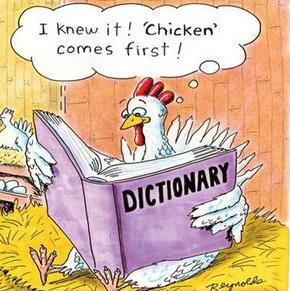 But now they believe they have cracked the conundrum of what came first: the chicken or the egg. British researchers say the chicken must have come first as the formation of eggs is only possible thanks to a protein found in the chicken’s ovaries. ‘It had long been suspected that the egg came first but now we have the scientific proof that shows that in fact the chicken came first,’ said Dr Colin Freeman, from Sheffield University, who worked with counterparts at Warwick University. ‘The protein had been identified before and it was linked to egg formation but by examining it closely we have been able to see how it controls the process,’ he added. The protein – called ovocledidin-17 (OC-17) – acts as a catalyst to speed up the development of the shell. Scientists used a super computer called HECToR, based in Edinburgh, to ‘zoom in’ on the formation of an egg. It showed OC-17 was crucial in kick-starting crystallization – the early stages of forming a shell. The protein coverts calcium carbonate into calcite crystals which makes up the egg shell, creating six grammes of shell every 24 hours. Prof John Harding, also of Sheffield University, said the discovery could have other uses. ‘Understanding how chickens make shells is fascinating in itself but can also give clues towards designing new materials,’ he said. Next challenge: Why did the chicken cross the road?